Whether you invest through a Traditional 401(k) plan, a Roth 401(k) plan, or a self-employed 401(k) plan, there are at least two significant penalties that can hit you if you aren't careful in the way you handle the account. Both of these 401(k) penalties can cost you tremendous amounts of lost wealth once you factor in the power of compounding and should be avoided if at all possible. By teaching you what they are, I hope to give you a better chance of never knowing first hand the pain of having money taken from you that should have stayed in your pocket. 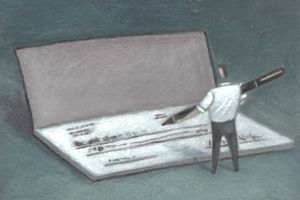 In exchange for the myriad of tax and asset protection benefits offered to investors who take advantage of the 401(k) plan, Congress sets some fairly strict rules on when, and how, you can make withdrawals from your account. The most common of these is a 10% early withdrawal penalty on money taken out of your 401(k) before you turn 59.5 years old. The 10% early withdrawal penalty is in addition to any Federal, state, and local taxes you would owe on your 401(k) withdrawal, making it possible you could have more than 50% of your money snatched from you as punishment for raiding your retirement coffers. How can you avoid this particular 401(k) penalty? There are some exceptions written into the law and for which you might qualify. You may be able to withdraw early without penalty if you become disabled, for example, or if you are a military reservist called to actice duty. If you avail yourself of one of these exemptions, you won't have to pay the 10% early withdrawal penalty, only the ordinary income taxes you would have otherwise owed. Congress is very specific when setting the 401(k) contribution limits that determine the maximum amount of money you can put into your account each year. As of 2018, that maximum is $18,500 each year. If you exceed this limit, you are guilty of making what is known as an "excess contribution". Excess contributions are subject to an additional penalty in the form of an excise tax. The penalty for excess contributions is 6%. If you remove the excess amount prior to the end of the tax year, you will not be assessed a penalty. In other words, there is good news in that you might have a chance at avoiding this 401(k) penalty if you get the excess contribution out of your account before the tax deadline for the year it was contributed. Although the two 401(k) penalties we just discussed—the 10% early withdrawal fee and the surtax on excess contributions—are the ones ordinary investors are most likely to encounter in their lifetimes, there are other situations in which you might find yourself paying money you wouldn't have otherwise owed if you followed the rules. One example is the use of borrowed money within the 401(k). Affluent and high net worth investors who either have a special type of 401(k) known as a "self-directed 401(k)" or those who have transferred their 401(k) into a self-directed Rollover IRA might be tempted to invest in things such as a master limited partnership or specially established limited liability companies. For the right investors, under the right circumstances, especially when done by an asset management company that caters to the rich, the complexities that arise can be worth it. These complexities can be planned for, mitigated, and factored into the return calculations. For do-it-yourself investors, it's a much different calculation. They might not be aware that they risk triggering something known as the UBIT, or unrelated business income tax; that their 401(k) or Rollover IRA would have to actually file its own tax return and pay taxes that would have otherwise been tax-deferred or tax-free. Not only that, but the global custodian holding the securities will charge, in almost all cases, materially higher fees. Again, it can still be worth it if your net worth is sufficiently high but it's not a common practice for average investors.